Touch ID: is your finger the key to the future? Putting an end to passwords and passcodes? 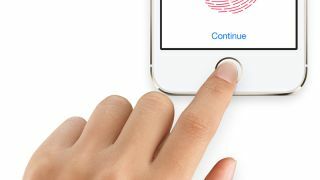 Apple's latest and greatest iPhone 5S comes with an integrated fingerprint scanner to prevent unauthorised access and make it easier to get into the iTunes Store - is it another game-changer from the Cupertino company or a needless gimmick? We take a look at the history of fingerprint scanners, the tech underpinning Apple's new toy and asks how much of a difference Touch ID will make to our mobile-powered lives. The new Touch ID capacitive sensor sits under the familiar Home button, making it slightly less concave as a result. The button itself is made of laser-cut sapphire crystal (to avoid scratches) and surrounded by a stainless steel detection ring that can tell when you're trying to log in and when you're just trying to launch Siri (you don't actually need to press down to use the Touch ID technology). The sensor is 170 microns thin (thinner than a human hair) and can scan your fingertips at a resolution of 500ppi in any direction. It's also able to scan sub-epidermal skin layers — in other words, it'll still work in less-than-perfect conditions (with hands made raw from the cold British winter, for example). Once your iPhone has a scan of your finger, it stores your fingerprint in a secure encrypted format on the integrated A7 processor. Apple is promising that the data is not passed to third-party apps (at least not yet) and doesn't leave your device - it isn't backed up to iCloud or stored on Apple's servers in any way. Whenever you match the fingerprint that's stored, you're in. It's a bold move, if not a completely original one. Carolina Milanesi, Research VP at Gartner, thinks Apple's move can be a success: "Apple seems to have put a lot of work into the Touch ID - they absolutely know that it has to work flawlessly for users not to be put off. "I think linking it to the iTunes login is a nice touch, no pun intended. Apple's timing is, in more cases than not, not a coincidence so I am sure we will see more biometrics in their devices." Keep your eyes on the new range of iPads. Haven't we seen this before...? Fingerprint-scanning technology has been in consumer devices for some time. IBM was rolling out fingerprint scanners in its laptops back in 2004, and we've seen it used in Microsoft's line of mice on and off since 2005. 2011's Motorola Atrix 4G had an integrated sensor in it until the unit was withdrawn due to poor sales. Apple hasn't come up with this technology all by itself, either: you might remember it acquired biometric security experts AuthenTec in June 2012 and the fingerprint authentication company Microlatch later in the same year. AuthenTec's fingerprint scanning expertise has been seen in the past in handsets such as the waterproof Fujitsu F-01A. Two weaknesses in the technology up to this point have prevented it from gaining serious traction: firstly, it hasn't always worked with any great degree of accuracy, leading to users jabbing at their handsets in frustration. Secondly, it has been known to be easily fooled in the past (using plasticine or photocopies for example). If Apple can overcome these problems — and early hands-on impressions from the launch event are that it has a good chance — then we might eventually see sensors such as the one in the iPhone 5S replace passwords and passcodes for good. Tony Cripps, principal device analyst at Ovum, spoke to us about Apple's implementation of the technology: "The word from the event is that the Touch ID system actually works very well. The risk with many fingerprint ID systems historically has been their failure to recognise repeatedly and consistently the fingerprint registered on them.